Cordless drills have come a long way over the years, offering users a convenient way to move drill bits and screws into materials with ease and power. Without having to worry about a power cord getting in the way, cordless drills have unmatched portability and maneuverability. This guide will cover some of the best 18v cordless drill options that pack a lot of power into a solid 18v battery that gives just the right amount of performance for light to moderate projects. Our top 5 best cordless drill 18v options can meet a range of budgets with the variety of features they provide. Bosch 18-Volt Compact Tough Drill/Driver Kit is one of the lightest options at only 3 lbs. yet has excellent torque to deliver power to every project. The DEWALT DC970K-2 18-Volt Compact Drill/Driver Kit is a super-compact tool that can reach into the smallest, tightest areas. Ryobi P208 One+ 18V Lithium-Ion Drill/Driver is a budget-friendly cordless drill with a keyless chuck and a convenient magnetic tray that can hold and catch screws as you work. The Genesis GCD18BK 18 Volt Cordless Variable Speed Drill has a couple of helpful features, like a built-in level and LED light, to help move your project in the right direction. One of the best features of the Hitachi DS18DGL 18-Volt Cordless Lithium-Ion Drill is its variable torque with 22 positions to adjust to the needs of just about any project you’re working on. Here, we outline some of the stand-out features of our five favorite 18v cordless drill options to help you come to an informed decision about the best drill for your needs. Not only is the Bosch 18v cordless drill stylish, but it’s also compact, lightweight, and powerful enough to meet the needs of most projects. Although this drill weighs in at only 3 pounds, it can still deliver up to 350 inch-pounds of torque. With its built-in LED light, you can even use this Bosch drill in areas where lighting may not be the best, like warehouses or garages. With its variable speed trigger and two transmission speeds, you’ll have easy control over how much torque the drill provides, allowing it to work with a wide range of materials and project types. 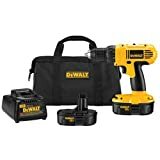 This kit comes with two Lithium-Ion batteries, a charger, the drill, and a storage case at a lower price than you can buy some cordless drills on their own. Several customers have replaced their old, worn-out drills with this one by Bosch and have been nothing but impressed. One of the most common praises is how light the tool is and how comfortable it is to use one-handedly. This DEWALT cordless drill is a little outdated in its use of a NiCAD battery, but if you’re interested in saving money with a full kit, this can be a budget-friendly option for you. The kit comes with the drill, battery charger, a storage bag, and two batteries, so you’ll never go without one charged up and ready for you. This drill’s best feature is its design, which is meant to reach into small, tight spaces with ease. The handle is meant for a one-handed grasp, and since the drill is so lightweight, its weight shouldn’t contribute to hand or arm fatigue while using it. The keyless chuck gives you an easy way to swap out bits. The chuck also grasps bits tightly to prevent movement or slippage while you work, allowing you to drill precisely where you need bits or screws to go. Despite the NiCad battery, which some customers say is a slight disappointment, most customers agree that the DEWALT offers incredible power for such a compact tool. This Ryobi comes alone, without any battery or extras. However, if you already own other Ryobi power tools, you’ll likely have a battery that works with this drill, so you can benefit from the super-low price point of the tool. This drill can work with several other Ryobi batteries, including NiCad or Lithium-Ion batteries. Choose from two transmission settings and variable speeds within each setting to give you the utmost control over its usage. Although the trigger doesn’t adjust speeds, you can vary between each speed by rotating the clutch between uses. Ryobi included a rubberized grip on the handle for safety and comfort. For convenience, the magnetic tray attached to the drill can hold and catch bits and screws you’re working with. One concern some customers have with the Ryobi is its reliability at high speeds. A few have noted that the chuck doesn’t seem to hold bits securely as the drill gets higher in speed, which can result in damaged projects from a wobbling bit or screw. The Genesis is a NiCad battery-operated tool that could be perfect for light jobs around the home. If you have massive projects that require a lot of power, this drill probably won’t be for you, but it has just enough power and reliability for small woodworking projects. This drill also offers some unique features you don’t find in similar tools, like the built-in level that can help ensure you’re drilling a straight hole into a wall. The base also has a small magnetic tray that can hold bits and screws as you work. You can adjust your speed as you work with the trigger, and you can also switch between 16 speeds using the clutch. The clutch rotates up to 550 RPMs, which is what you’d want for putting together furniture or drilling holes for hanging pictures. Some customers have had issues with the charger and battery becoming very hot, but others say that the battery holds a reasonable charge for a long time and the drill has the right amount of power for their light household projects. The Hitachi cordless drill isn’t the most compact, so it may not be the best option for tight spaces, but it is lightweight and has a well-designed grip that can make it easy to use one-handedly. We like that the LED light is on the base of the drill, which lets it light up a wide surface area without your hand or the drill getting in the way. Choose from 22 torque settings by rotating the collar around the clutch, and then adjust your speed further with the variable speed trigger to gain ultimate control over the drill. The biggest complaint customers have isn’t about the drill itself, but about its battery, which seems not to have as long a lifespan as they’d expect. However, the battery does have a 2-year warranty during which you can replace it if you have the same issue. Most new drills have speed control built into their triggers for one-handed operation. To adjust the at which speed the chuck and bit turn, you just need to pull in slightly on the trigger. This critical feature gives you more control over your bits and screws, depending on the type of material you’re working with. Some cordless drills use a NiCad battery, which is a more traditional type of battery found in older machines. These batteries tend to keep costs down, so you’ll usually see them in more budget-friendly models. If you don’t mind spending a little extra for a high-performing drill, you should consider opting for one with a Lithium-Ion battery. Not only do they charge faster and last longer than NiCad batteries, but they’re also more lightweight and can reduce the overall weight of the drill. One of the most significant benefits of cordless drills is that they’re usually more compact and portable than their corded counterparts. Purchasing a large, heavy cordless drill strips you of the benefit of having a tool that you can maneuver easily. Consider buying a cordless drill that’s small in size so that it can fit into tight spaces and light enough to prevent fatigue in your hands and arms as you use it. You should be able to change out bits quickly and easily. The simplest way to do this is by buying a cordless drill with a keyless chuck. Unlike a keyed chuck that requires a special tool to remove and add new bits, a keyless chuck lets you change bits by pulling on the chuck, removing the old bit and adding a new one, and releasing the chuck to lock it in place. Should I Choose a Brushed or Brushless Motor? Many power tools are switching over to brushless motors, and this feature is something you should consider looking for in your next power drill. Brushless motors use a circuit board rather than a commutator and brushes to deliver energy directly to the tool. What you get is a longer-lasting motor and a better performance than traditional cordless drills with brushed motors. However, brushless motors are typically much more expensive than brushed motor tools, so you’ll have to consider whether it fits in your budget. Bosch is one of the biggest names in the business, and we believe the Bosch 18-Volt Compact Tough Drill/Driver Kit is one of the best cordless drills your money can buy. It has most of the features we prefer in a cordless drill, like a Lithium-Ion battery and a compact size. More importantly, the Bosch drill offers enough power for you to complete just about any project, drilling holes in wood to working with heavier materials, like metal or plastic, thanks to its variable torque and speeds. Whether you need a budget-friendly cordless drill for quick tasks around the home, or you’re looking for something more powerful and versatile, we’ve given you some of the best 18v cordless drill options in 2018, which we hope will help you find the best tool for your needs.